It may be the end of World Breastfeeding Week, but the entire month of August is dedicated to breastmilk. 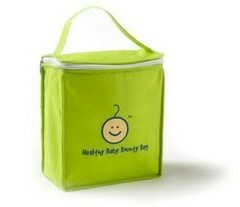 Just in time, 200 hospitals of the 7,569 nationwide have ditched the formula freebies in favor of Healthy Baby Bounty Bags. And there’s not a drop of imitation breastmilk in them. Because you know what? Getting a formula sample after you’ve given birth is like being given a Big Mac after your annual physical. Sure, it’s “food“, but it’s not the same, not as healthy. These goodie bags contain samples from companies that make products that actually support breastfeeding. Sure, they’re companies giving breast swag to get noticed, but this is for good reason; to encourage breastfeeding while ditching the formula. Best part about the new mom swag? The bags are green. Not only are they reusable as a breastmilk cooler, they’re made of recycled materials. Righteous. So what kind of goodies can these mamas expect? This is just a baby step. We have a long way to go before breastfeeding has the same promotional support in the maternity ward that formula has today. With more involvement from companies that support breastfeeding mothers, we hope that number will continue to grow. Samples of nursing pads, breastmilk storage bags, lactation tea, and other goodies. Info and coupons from companies such as Lansinoh, Bravado! Designs, Ergo, BebeAuLait, and My Brest Friend. But breastfeeding is designed to be easy. Ideally, you don’t need anything but an open baby mouth. What do you think, folks? It this a positive move, a step in the right diretion for proper infant health? Or is it just more “stuff” for something that seemingly needs very little for success? Image: via the press release. I’ve always been supportive of my wife Andrea for breastfeeding both our children for more than a year each. I can’t believe that there is such and outrage by some about breastfeeding in public. I don’t know whether to laugh at the stupidity or get really, really mad at the stupidity. I think for right now it is a definite step in the right direction. Obviously, if everything was just “normal” and hospitals weren’t trying to woo business why would their be goody bags, but you know if they are going to exist they might as well have Bravado and nursing pads in them! Gift certificates for lactation consultants would be more helpful than some of the present contents, I think, or even just a list of breastfeeding consultants’ contact information and ditto for La Leche League. I meet a lot of moms who didn’t breastfeeding because they had some trouble after leaving the hospital and didn’t know where to get help. All new moms should really have home visits from a public health nurse or breastfeeding consultant to ensure that mother and baby are settling in and getting things to work. I appreciate that thought. Of course, I’m kind of with you here, too. I don’t believe in getting more “stuff”, even if those freebies (or some of them) are useful. I agree: what would be really helpful would be if LLL or similar groups would put together a booklet/sheets of troubleshooting data like they have on their Web sites. Paired with that should be local consultants and group meeting times. But as a substitute for what is currently given, this is a good change! I resent comparing baby formula to a Big Mac. As a mother who desperately wanted to breastfeed, but needed to supplement with formula, It took me months to not feel like l was harming my baby. Nursing is the ideal, but not for everyone and we shouldn’t be made to feel like child abusers when it doesn’t work out for us. Kathy should look at this in a different light. One lactation consultant gave me the idea and it really works. If you did not have diabetes, no one would EVER think of giving you free samples of insulin. It would actually be risky to take it. If you had type I diabetes, you would not feel any regrets about taking insulin — and your doctor would be empathetic while your doctor told you how to manage and compensate for your health risks. Ditto for type II diabetes. In theory, one should be able to manage through diet and exercise but it is NEVER that simple. Your doctor should be empathetic to the challenges, help you figure out how to compensate for the health risks and you would use insulin if needed if you cannot control the diabetes. In this case, neither the efforts Kathy went through to try to breastfeed would be minimized. I’m sure she worked harder than any mother who had an easy time breastfeeding. I would have made sure she valued what she did try to do. And Kathy should have been counseled through compensatory mechanisms for the fact that she could not resolve those problems. While the health risks are real and well documented these do need to be balanced against other health risks. Just as in any health condition, we can take steps to manage and minimize and balance risks in ways that enable mothers to feel competent and confident. As for the bags, great that they’re green. I am generally against promotional samples because they cost the consumer more money. If you continue to use the product you are paying for the promotional samples. Formula feeding mothers pay an extra $700 per year for the promotional samples given out in hospitals that are often wasted. I’ve even seen parents who gave their baby a sample from the hospital that was expired by a year. It was horrible — clumps of congealed gunk. All because of the huge excess of samples given to the hospitals to the point that they can’t find storage space for it and are wasting the time of nurses to manage the products. I think it is a welcome change. Bravo! Kathy, thanks for saying what I was thinking. I’m a mom whose grief over not being able to breastfeed nearly drove me into postpartum depression. I felt like I couldn’t possibly be a good mother to my son when I couldn’t even give him what every animal can give her young, when all I could offer him was second-best. I think the easy venom towards formula can turn into easy cruelty towards moms who must formula-feed or supplement. I know no one means it that way, but that’s how it feels. Susan, I like your metaphor — when I was pregnant I was an insulin-dependent gestational diabetic — I absolutely hated being diabetic, but I sure was grateful that insulin existed. Similarly, I absolutely hate that I can’t breastfeed, but thank god that formula exists (though I’d be even happier if we had some social structure for wet nursing — but that’s another subject). I often say this in my breastfeeding blogs, but didn’t think to write it here. I supplemented with my older son, and not because I couldn’t breastfeed, but because I couldn’t pump enough for when I was at work or pump enough in my stressful work environment. Luckily, my shifts were evening shifts, so he was still getting breastmilk more than he would if it were during the day. I’m doing better this time around. What lactivists like myself are fighting is the idea that breastmilk can be easily substituted with formula. They’re not the same. It’s not like swapping out broccoli for kale as a side dish. Formula is lacking compared to breastmilk. The formula manufacturers have people believing otherwise, and frankly MOST people supplement for reasons like mine (or less), not for the rare case of not being able to breastfeed. I wish we will have the same in our country soon! I have to agree wih Kathy. I would have loved to enjoy breastfeeding my first child, but nature would not allow it. Having a happy, FED baby was more important to me than winning a losing battle. No lactation consultant, visiting nurse, or anyone else for that matter could force this “natural” thing to happen for me. My son is a handsome, happy, intelligent 16 year-old who never suffered one minute because he wasn’t breast fed. I live in England and because of the NHS we have a real drive (admittedly it’s driven by goverment targets) to encourage breastfeeding but it’s unfortunate the in the end both mothers the do and don’t breastfeed end up feeling persecuted. The problem is encouraging the ideal while ensuring no one feels singled out. For me formula is like vitamins, it’s useful and an important development in order to support those who need it. However no one can claim that if we have multivitamins we should all just use them rather then eating fruit and veg. So in the same way that saying people should eat veg because it’s good for them, isn’t intended as a shot at those people who for whatever reason take vitamins (because they can’t consume enough of the things they need from food) encouraging breastfeeding is not intended to isolate the women who can’t. Would anyone be able to tell me how to get some of these reusable bags, and some of the contents in them. I work for Public Health and we are trying to do a breastfeeding promotion through our WIC program and were thinking of handing out bags with useful items for our breastfeeding moms.